The mixture should be well cooked and a dark golden brown. Set aside. 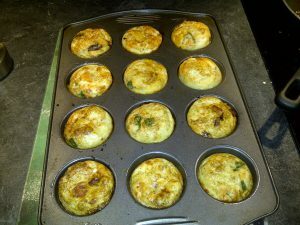 Line 12 muffin tins with parchment paper liners (makes clean up a breeze with no added fats and no flour) and set aside. Combine eggs, milk or water and salt and pepper. Whisk until well combined. I do this in a 4 cup measuring cup … it makes pouring into the muffin tins a breeze. Add a little Mushroom Mixture, cheese and parsley or basil to each tin. Cook for approximately 15-20 minutes. The frittatas should be golden brown when done. Remove from tins (very easy with the parchment liners) and place on rack to cool. Remove parchment liners as soon as they are cool enough to handle. The frittatas are great warm as well as cold. They’re a quick addition to breakfast or a snack on the go when you need a good hit of protein.